A Matomaton military history reference book. The Great Boer War, Doyle, Arthur Conan Doyle's extensive and extensively revised (in sixteen editions over two years) work of the causes and prosecution of the Second Boer War. From general discussions of the causes and the Boer state to detailed descriptions of the key battles, Conan Doyle committed himself to offering his readers a comprehensive view of the conflict. 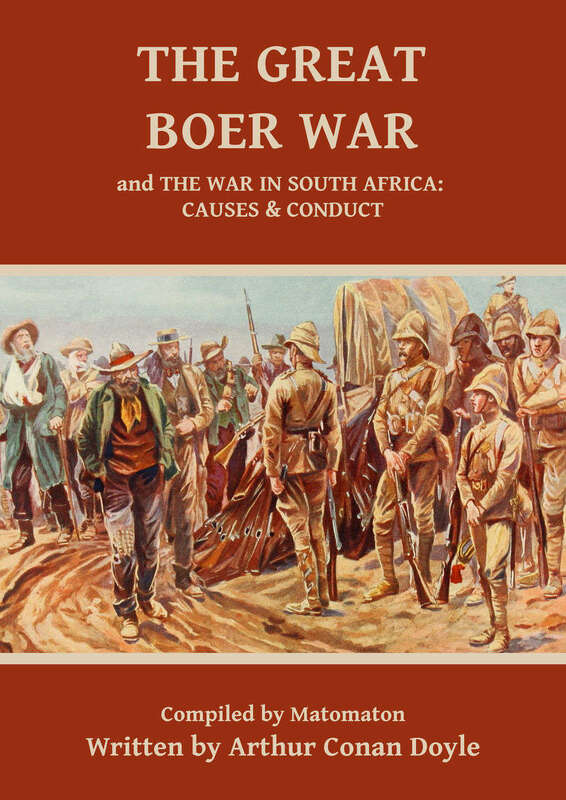 This PDF also includes the complete The South African War: Causes & Conduct, an additional ninety-seven page article on the subject. -- Four pages for the cover, title page, the table of contents (with active links to each section of the text) and Conan Doyle's preface. 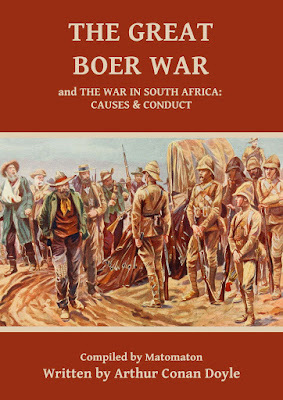 -- Thirty-nine chapters of The Great Boer War plus The South African War: Causes & Conduct. -- Two appendices, one with a three page table of the official casualty statistics and the second containing five maps. This is a companion to The British In Africa, which details British military actions in various parts of Africa up to the First Boer War. There are also map, illustration and photograph collections along with a collectable cards collection. Better known as the writer of the Sherlock Holmes stories and by the title Sir Arthur (he became a Knight Bachelor the same year that the final edition of this book was published), Conan Doyle was also a qualified doctor, a keen sportsman, a political campaigner and a spiritualist. He wrote on all of these topics as well as his fictional works and on the matter of the Boer conflict sought to offer a thorough and accurate account that was fair to the Boers as well as the British. Please be aware that the text of this PDF was written in an age when sensibilities were somewhat less delicate and attitudes to peoples not of the British Isles were considerably less enlightened. I've long been fascinated by military history and over the years have gathered a collection of reference books and images like those included in this PDF. Now I've been encouraged to make them available to other wargamers and roleplayers for reference and to add period detail to related games. These PDF files may not be resold or redistributed. If you are interested in using copies of the individual images for use in commercial projects, please contact me via my website.